Mandy is only the second feature film from director Panos Cosmatos, but every moment of it pulses with a deranged lysergic energy that announces the arrival of a great individualist talent. Prolific is not – just yet, anyway – a word you can associate with the Italian-Canadian director Panos Cosmatos. His debut feature film Beyond the Black Rainbow was released into the world eight years ago, receiving a mostly lukewarm critical response among its early viewers. However, in the years following, word spread about its colourful, cinema-literate style – earning it something approaching cult status for midnight movie fans. If that means anticipation is running hot for the follow-up, then it’s founded on the belief that Cosmatos may just have flirted with, if not genius, then whatever word critics are supposed to use to describe filmmakers who clearly love King Crimson and Michael Moorcock fantasy novels. 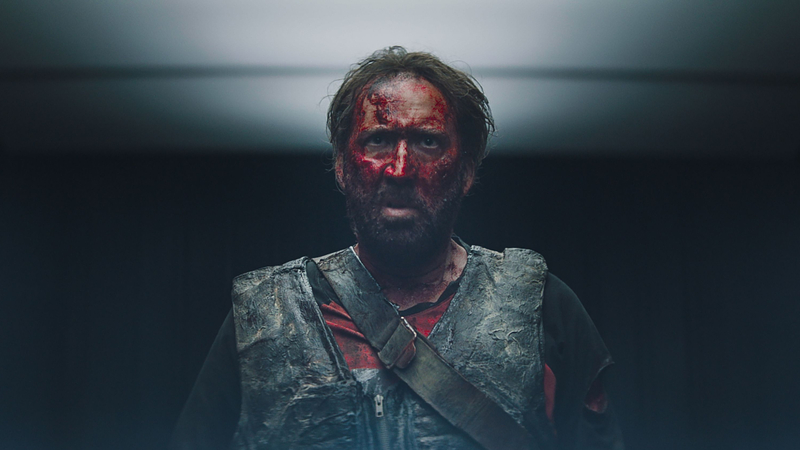 Mandy tells the story of a logger, Red (Nicolas Cage), and his girlfriend Mandy (Andrea Riseborough). Due to a chance encounter with a terrifying cult called the Children of the New Dawn – led by creepy Todd Rundgren lookalike Jeremiah Sand (Linus Roache) – the pair fall victim to the sadistic whims of a lunatic posse. Summoning a nightmarish gang of sub-human bikers to enact his will, Jeremiah takes Mandy prisoner, sending Red off on an acid-soaked revenge mission which has to be seen to be believed. With a freshly-smelted axe of his own design comfortably in hand, Red does what he has to do for the woman who means the world to him. Mandy is not just hideous, hilarious and thrilling – although, it’s all of those and then some – it’s also a meditation on personal grief which loses no poignancy for all its blood-soaked insanity and eye-melting psychedelia. The film won’t just stay with you: like a powerful trip, it’s artful, glowing frames will hit you in flashbacks when you least expect it. The mad, staring eyes of Cage have never been put to such good use than in those moments of the film where his character lets the bonds of his sanity slip, dissolve and loose. In making this film, Panatos has achieved that rarest of things, wearing his influences lightly and combining a fascination with heavy metal iconography, VHS horror nasties and a twisted video game logic into something at once familiar and entirely unlike anything you’ve previously experienced.